"Yes, traffic safety needs to be followed, but we want to make sure immigrant workers can survive and make a living," the lower Manhattan pol tells Streetsblog. For Council Member Margaret Chin, Mayor de Blasio’s crackdown on e-bike delivery workers, announced last October, was hardly the first time she’d heard about the challenges facing delivery workers who use electric bicycle to do their jobs. In fact, Chin became aware of the heavy policing endured by immigrant delivery workers around four years ago, when workers began coming to her office regarding tickets they’d received while doing their jobs. Naturally, then, she was the first council member to stand alongside delivery workers in their opposition to the crackdown. 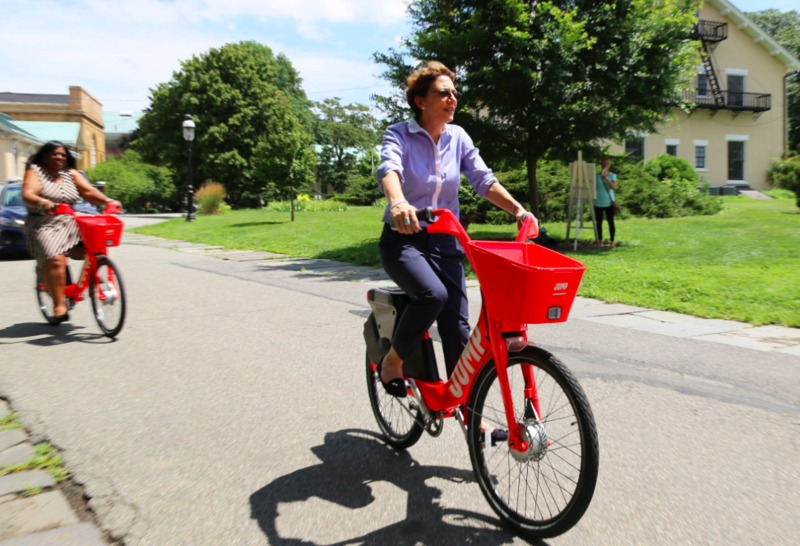 She’s continued the fight since, testifying to DOT in May in favor of e-bike rules that would allow workers to convert their bikes from throttle-powered to pedal-assist. Streetsblog spoke to Chin last week about the ongoing fight for the dignity of the thousands of workers who delivery food to New Yorkers by electric bike. This interview has been edited for length and clarity. How did you become aware of the e-bike issue? Delivery workers coming to our office with tickets. This was even a couple of years back, in 2014. People were getting their bike confiscated. We were helping them fight their tickets and get their bike back. A lot of them were between the age of 40 and 60, and they work really long hours. Sometimes they have to bike up like 30 city blocks for one delivery; It’s not like delivering around the corner, or whatever. It has become further and further away. A lot of them don’t speak English well, and they don’t know the state and city regulations on these e-bikes. But they’re available to buy, so for them, especially the older workers, in order for them to make the delivery quickly — because the customer wants their food fast and hot — and in order for them to maybe get a better tip, they’ve got to make sure they deliver quickly as possible. But more and more they’re getting tickets. It’s just so sad — when their bike gets confiscated, that’s their livelihood. Sometimes the tickets are very very expensive, like $500. You know, that’s more than their salary for the week. Why was there an increase in 2014? We asked, “Why are people using e-bikes?” And it turns out that, hey, there are more and more further deliveries. And then also there’s a lot of laws that have been passed, like, that delivery workers have to wear uniforms that show the restaurants where they work, and they have to wear helmets and things like the that. But also, even though the city is supposed to crack down on the businesses, oftentimes, the tickets are given to the workers, especially if they were using e-bikes. What do you hear from the workers? We asked them [through surveys], if they were interested in the possibility of getting licenses and insurance. A lot of them were interested in that. But that means that we need to get the state to legalize the electric bicycles. But this is going on not just in the Asian community. This is happening across the city. There are other delivery workers, latino and African immigrants — it’s really affecting the immigrant community, and many of them are doing this delivery work to survive and support their families. It seems that you’re the only Manhattan council member sticking her neck out for delivery workers. Your colleagues say they get complaints about them, and typically respond by encouraging more police enforcement. What’s the sentiment on the City Council about this issue and why have you chosen to stand by delivery workers? We’re not avoiding the question of safety. We all want Vision Zero safety. That’s why in the past we have pushed for safety for delivery workers, with helmets and making sure they’re safe on the road and they should follow traffic rules. Nobody’s against that. But in terms of all the crackdowns, the delivery workers are telling us [that] a lot of time they cannot negotiate because their English is not that good. And if a cop stops them and gives them a ticket, they can’t fight against it. They can’t say, “Wait a minute I didn’t run a red light,” or “I didn’t break the law.” The cops just write them a ticket. Sometimes, they confiscate their bike, and it’s very difficult for them to get it back. It takes a lot of time and they lose their livelihood for that week. There are more and more council members that are supportive, from all over the city, because it’s not just happening in Manhattan. So we’re all trying to work together to make sure that, yes, traffic safety needs to be followed, but at the same time, we want to make sure these immigrant workers can survive and make a living — because they need to feed their families. How should the city be handling this challenge? DOT put forth this rule change, but it did not address the real issues. It seems like all of a sudden the city wants to promote these pedal-assist electric bicycles [like] Citi Bike. They want to promote those … so all of a sudden, now, the city is looking at the issue. Great! But that doesn’t affect delivery workers, because they use [throttle-controlled] electric bikes. We’re asking the city and the mayor: Help these workers legalize their electric bikes, help them convert it, and promote a public education campaign in [multiple] languages on how they can convert their bikes. This way, they can continue to work and make a living. Until we can get the law passed in Albany to legalize all electric bikes, right now we have to deal with what we have. Do you want the mayor to call off his crackdown? They should definitely provide a grace period to allow the delivery workers to convert their bikes. Look, if a delivery worker is running a red light, they should definitely get a ticket. If they are violating traffic rules, if they’re going in the wrong direction, they should get ticketed. Those kinds of enforcement should be done, but they should not be confiscating their electric bikes and taking away their livelihood. The throttle ban is just as stupid. Why don’t these delivery workers just buy pedal assist bikes? Like you know the deal going forward. Cost most likely. Most likely already have throttles. And even with pedal assist bikes, you still need to pedal. These people are not riding for exercise, they are working. Requiring them to pedal is stupid and really restricts those who have difficulty with long durations of this type of activity). I’m all for active transport, but it’s not for everyone all the time. That’s how you end up with gas powered scooters filling the gap. how did they do this job before e-bikes for decades, then? The dynamics of the job have changed. The average number of miles has greatly increased due to greater coverage, leading to more demand for eBicycle deliveries. In the past you saw a lot more deliveries via automobile citywide. eBikes replaced a lot of those trips, and added a ton more. And this greater coverage is a result of convenient apps like seamless etc. In my experience, where workers rode a max of 1 mile to make a single delivery, restaurants can now deliver up to 3 miles, for ONE delivery. It’s also worth remembering that these folks work for tips, in a work environment where wage theft is rampant. So every delivery counts, and again my experience, e-bikes allow folks to make way more deliveries in one day, and therefore more take home pay. You really can’t get a job doing deliveries anymore without an e-bike, especially outside of manhattan. Workers have indeed told me that pedal assist bikes are actually MORE dangerous, contrary to whatever unknowledgeable city officials say, than throttle bikes, which allow more nuanced engagement of the motor. Ultimately, workers should not bear this cost. If the City is really going to put in place laws untethered from actual data, it should itself pay for the consequences, not workers, from whom the city has already extracted millions in tickets and confiscated property. Also, they didn’t have to wear a vest with their employer’s name on it or a helmet. These rules are stupid and have zip to do with safety but nevertheless they are burdensome, especially on warmer days. It’s no surprise they opted for e-bikes. I would have done the same thing. Look, if a delivery worker is running a red light, they should definitely get a ticket. If they are violating traffic rules, if they’re going in the wrong direction, they should get ticketed. While we’re tackling the issue of e-bikes, let’s acknowledge once and for all that it makes zero sense to apply rules designed for motor traffic to bicycles. Sure, delivery workers should be ticketed for truly dangerous behavior like going 20 mph on a crowded sidewalk. However, any behavior that is safe should be legal, whether it’s passing a red light after yielding to pedestrians or slowly riding on the sidewalk. As for wrong way riding, I’m generally not a fan of it and seldom do it myself, but it makes sense to legalize it by making streets which are one way for motor traffic two-way for bicycles, provided the room exists. So long as the bike lane is explicitly two-way and there are plenty of signs indicating this to pedestrians, there is nothing wrong with going the opposite direction of motor traffic. I would think throttled powered bikes would be more dangerous. I normally see older people delivering on them, who are more likely to have lower reaction times due to their age. And mostly these types of bikes go at least 20-30 mph, where the average cyclist on a traditional bike goes about 10-15 mph. And e-bikes, particularly the ones that these delivery men use, are like 40+ lbs , compared to a traditional bike weighs closer to 20lbs. So e-bikes are heavier, faster, and are operated by people who may not be as well attentive or reactive than a traditional delivery bicyclist, so I would see a delivery person riding an e-bike as being more dangerous than a person delivering on a traditional bike. The type of speed control has nothing to do with speed or weight. Most electric bikes travel 18-20 MPH , some models can go a bit faster but it’s less common. The weight difference is negligible as well. You need to consider the total weight, not just the bicycle weight in a collision. And the age range of delivery bicyclist is very wide. Those are poor reasons to oppose eBikes. They are not dangerous, there are only riders who make dangerous choices. It is a combination of.weight, speed and lack of any regulation. These bikes easily get up to 25mph while regularly being ridden every which way but up. They are unlicensed and uninsured used only to increase the profit of a restaurant that is happy to look the other way while their delivery persons put the public at risk. Restaurants have increased their delivery areas requiring deliveries of up to a mile (or more). Why should we be accommodating these greedy restaurants at the expense of safety for the public and the delivery persons? See this link for a description of EU regulations for pedal assisted and throttle type E-Bikes. Throttle type e-bikes are considered the same category as a moped and must be insured, licenced and regulated. Throttle assisted e-bikes have no place in bike lanes on sidewalks or in parks. They should be ridden in traffic, with proper lighting and safety equipment and treated as what they are, a motorized vehicle, Restaurants that want to deliver over great distances using throttle controlled e-bikes should be required to provide insurance and training and should be held accountable. CM Chin would be better advised to work for meaningful commercial rent regulations so that restaurants are not forced to make most of their revenue via deliveries over increasingly longer distances.